Sunday school teacher Peggy Warden threw herself in front of her grandson when a gunman opened fire onto the congregation at First Baptist Church, getting fatally shot as she protected the 18-year-old, relatives said. The teen then shielded a child hiding under a pew. Warden, 56, was one of more than two dozen people killed in Sunday's shooting at the Sutherland Springs church. Her grandson Zach Poston was one of about 20 other people injured and described what happened from the San Antonio hospital where he was still recovering Thursday, said Warden's brother Jimmy Stevens. "Basically, Peggy stood up and just shielded over him while the shooter was shooting. And when she got hit in the back he said he turned — because he heard her — and when he turned to see if she was OK, she passed away immediately," Stevens said. Poston already had been hit in his arms, legs and side, Stevens said, when he saw a small child trying to get out from underneath a pew. So Poston shoved the child back under, Stevens said, and was shot again in the leg. 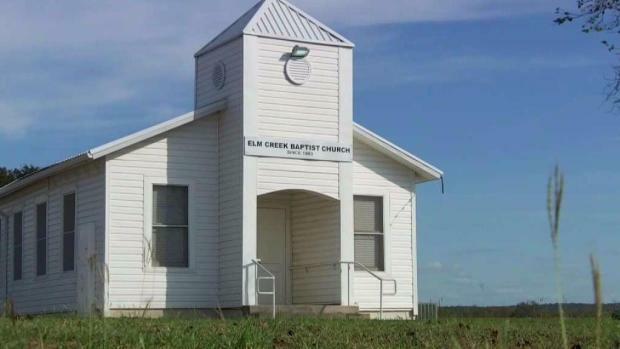 After the Sutherland Springs gunman opened fire at the First Baptist Church, a chase ended 11 miles away, right in front of another church where congregants were wrapping up their Sunday morning services. "So he took what Peggy gave him and he passed it on to help someone else," Stevens told The Associated Press on Thursday. He said it's his understanding that the child survived. Stevens said one of the congregants was a nurse who was able to help bandage Poston, likely keeping the high school senior from bleeding to death. "He will recover physically at some point; we just don't know what that point will be," Stevens said. "Our prayers and concerns are going to be for him and those others in there because of the mental and heartfelt torture they went through. It's still going to be in their mind," he said. The gunman shot and killed 25 people at the church. Authorities have put the official toll at 26, because one of the victims was pregnant. The gunman died of what appeared to be a self-inflicted gunshot wound after being chased by bystanders and crashing his car. Stevens said his sister taught Sunday school, but had only returned to being active in the church in recent months after spending more than a year caring for her husband, who had cancer and died in July. "Her goal was always to teach children and to make sure she was a disciple," Stevens said, adding, "Her goal was to teach those children so that they grew up with that strength in their heart."